I've been heating with wood for years, and I'm always happy when the nights cool in the fall and I can start the fire. Burning wood for heat is not for the faint of heart; there is a lot to remember, and it's important to be present and aware at all times. Living on a piece of land that has trees on it offers an incredible opportunity; the timber can be cut sustainably, which means for every tree cut down, two or more can be planted or cultivated to take the place of the one used for lumber or to burn for firewood. The most important skill a person can learn is to use a chainsaw; out in the woods, that skill can save a lot of aggravation and energy. Depending on the type of trees you have available, there are a lot of choices. In some areas, willows are grown in plantations to be used for biofuel, or made into pellets to burn. Willow is a wonderful wood; scented and sweet, it burns hot and clean. I use willow a lot for cooking over; it makes the food taste great with none of the turpentine flavor that you might get with a softwood. As an added advantage, willows can be cut forever, and just keep coming back from the roots, more vigorous than ever. It has the unfortunate disadvantage of only growing to a certain size, about three inches across, which makes it fiddly and time consuming to cut and stack. It is worth having a little of it anyway due to the lovely fragrance when it burns. There are a few things to remember when burning wood for fuel; it's fire (duh!) so it's important to be absolutely sure that your appliance is installed correctly. Get a WETT inspection, just to have that peace of mind. Other types of wood we're lucky enough to grow right here on the place are Douglas Fir. This is an evergreen and so it has pitch in the wood. It is also susceptible to a certain kind of beetle, and is fairly short lived after the beetle has attacked it. Standing dead Douglas Fir is the best of firewood, and will burn hot. 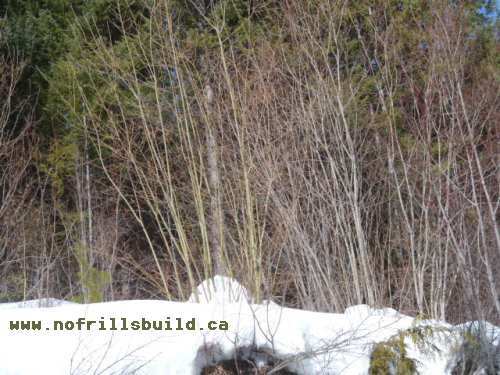 I like to mix it with other kinds of wood; larch (the primo and most sought after firewood around here) and a bit of pine or birch, if I can find it. I generally remove the bark, if it doesn't fall off by itself when you stack it to dry. The bark is where all the pitch is so removing it helps it to dry faster, and also reduces the risk of creosote building up in the chimney. It's very important that the wood is seasoned properly. You can cut down a tree that has been dead for years, split it, and think that's all it needs, but it still won't burn. Seasoning for at least a few months will dry it out under the bark, which generally will soot up the chimney when it burns. Losing some of the bark means there is less risk of a chimney fire - always a good thing. 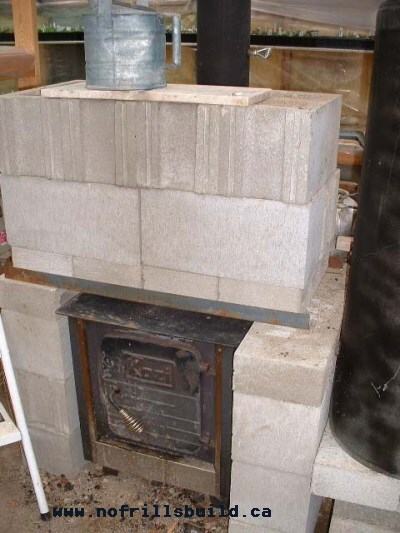 Your wood stove must be CSA approved, or UL listed. One thing to look for is the sticker on the back of the appliance, and the fact that it has a glass door. The chimney should be insulated where it goes through the roof, and double walled where it is exposed. Don't cheap out with this; one common cause of residential fires is inappropriate use of fireplaces. It's also critical to clean the chimney twice a year or so. We clean ours in the spring, when the heating season is mostly done, but then again in the late fall. Keep in mind that roofs can be slippery when frosty or wet, and tie off appropriately, or get a professional to do it for you. Wood stove in the greenhouse - the concrete blocks filled with sand warm up as the fire burns, and give off the heat over the next several hours. You might be curious about the way the blocks are adding thermal mass on my greenhouse heater - it's important to add the mason blocks only if your woodstove is on a firm base, as on the native soil seen here. Keep in mind that even empty, these blocks weigh about 40 lbs. each. Multiply that by 20 or so, and that can get very heavy, then add in the weight of the sand to fill them. These are arranged in rows and then the top lot are stacked on angle iron cut from an old bed frame. Note that this is not CSA approved - you can tell by the lack of a sticker on the back, and also there is no glass window. Even though it's important to be careful, I look so forward to having the fire to warm my house - it's cozy and so comforting in the cold dark winter months. 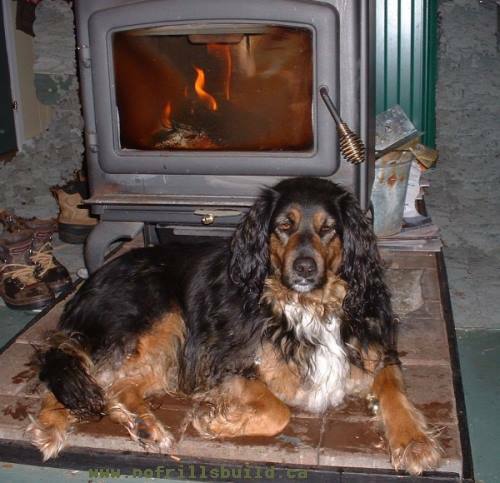 I can cook on the wood stove, and keep a kettle bubbling for friends when they drop by for tea. The heat from the stove is the only warmth I know that gets right to the bone; for me, there is no other option. 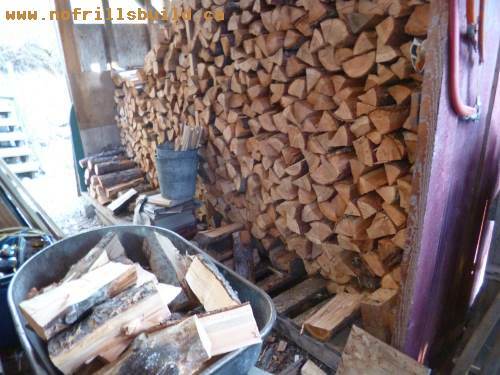 Update March 2016; This heating season (October through March) we went through approximately one and a half cords of wood to heat our 500 square foot house. This is much lower than what we expected; I'm pretty sure the six inch thick insulation in the walls, plus new energy efficient double glazed windows did the majority of keeping out the cold, plus a thick curtain over the windowed door. We also have a bit more insulation to go in the attic, and one more new window in the bedroom, a mudroom addition with a better fitting door. 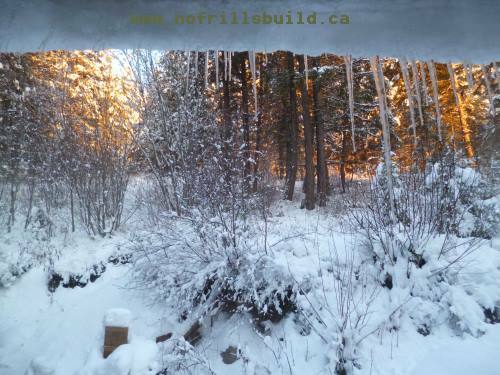 Sometimes in extremely cold climates it's useful to have an arctic entryway. This is like an air lock, and prevents warm air from indoors escaping to the outside. What's a cord of wood worth these days? We paid less than $200 for most of the wood we had brought in, but the other three cords were free, except for chain saw gas and labor. Moving the warm air around once your stove is lit is crucial. This little Ecofan works great - and doesn't require any electricity. It works off the heat of the stove itself to make the blades spin around.